Designing a Japanese restaurant, especially one outside of Japan, can be a tricky thing, especially if the goal is to avoid obvious tropes. For Ryota Kanesawa’s newly minted restaurant Ryota Kapou Modern in the midst of Hong Kong’s heaving Central district, local firm House of Beast have incorporated the light streaming in through the floor-to-ceiling windows with a thoughtful mood-board of textures and references. The Japanese elements are present, but in discreet touches of industrial cement tiles, washi, hand-crafted ceramics and marble slabs. 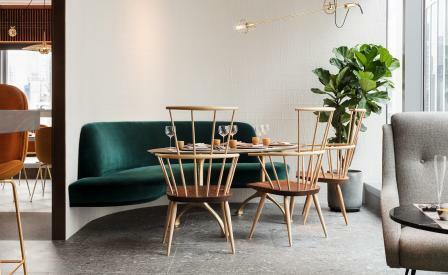 These are quietly offset by a more global palette that includes Beetle Bar chairs by Gubi, Matthew Hilton’s Kimble Windsor chairs, and Jader Almeida ceiling pendant lamps.